Feature: The plastic hard shell case cover was designed ONLY to be compatible with MacBook Air 13 inch No CD-ROM (A1369/A1466, Older Version 2017/2016/2015/2014/2013/2012/2011/2010). WARNING: This case is NOT compatible with other model macbooks. 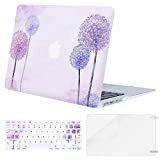 • The plastic hard shell case cover was designed ONLY to be compatible with MacBook Air 13 inch No CD-ROM (A1369/A1466, Older Version 2017/2016/2015/2014/2013/2012/2011/2010). WARNING: This case is NOT compatible with other model macbooks. • Please kindly check the model number "A1xxx" on the back of the MacBook before your purchase, make sure it matches the model number in the title "A1369" or "A1466". • NO Cut Out design, transparency is different from color to color. Fully vented for safe heat disbursement, fully access to all buttons and features. • Case Dimension: 12.9 x 9 x 0.8 inch, the MacBook Air 13 Inch Dimension: 12.79 x 8.94 x 0.68 inch. • Including 1 keyboard cover & 1 screen protector to protect your MacBook keyboard & screen against spills and contaminates. MOSISO 1 year warranty on case, keyboard cover.